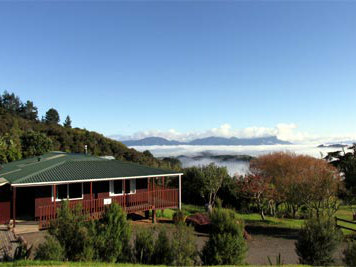 The spacious lodge is situated on 131 hectare farm about 150 metres above sea-level. Half of the farm is in native kauri forest, where you can walk to enjoy spectacular views.The lodge has a comfortable lounge with fireplace and large sun decks. Double, twin, family or dorm rooms are available, as well as on site caravans, camp sites and camper vans parking area. Disabled facilities.